Over the past few years, Pantone, the company that has become a leading trend setter when it comes to color, has branched out into various industries with numerous partnerships that help promote their color choices. And every year Pantone selects a color of the year. 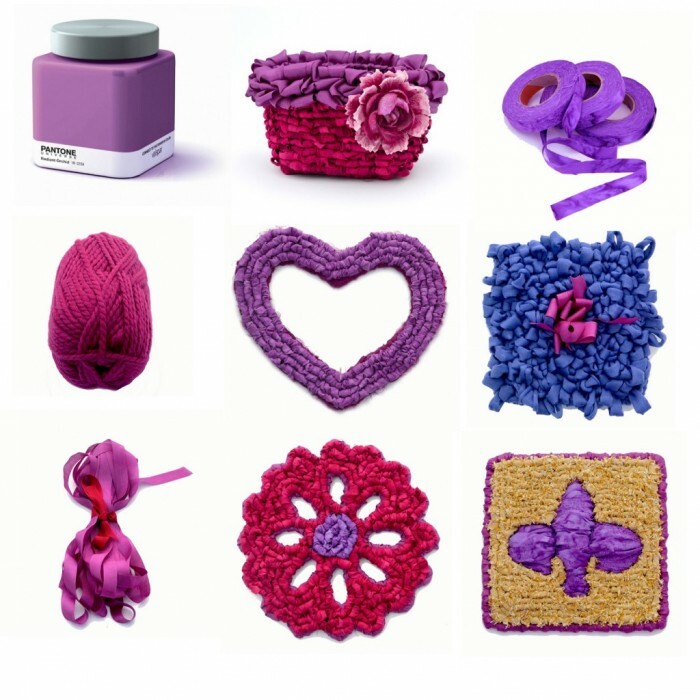 The 2014 color is a delicious and rich Radiant Orchid. It’s already being interpreted in many designs–from nail color and makeup, to designer fashions and remarkable interior designs and furnishings. Pantone even has indoor paint available in this rich color. Well here at my tiny Color Crazy studio, I was inspired to pull out some supplies and designs in varied shades of Orchid. (I even changed one of my fabric strip’s names to Orchid from Hyacinth! It seemed more descriptive.) It’s making me want to create with this yummy color when locker hooking. Below are some new locker hooked designs and some colorful inspiration. Pantone paint in Radiant Orchid. You can find it at most hardware stores like Lowe’s and Home Depot. Mini Blossom basket from Color Crazy in Mulberry Wine hand-dyed fabric strips and Orchid Rayon Ribbon. Free pattern available. Locker Hooked Heart in hand-dyed fabric strips and framed in recycled silk. Free heart frame pattern at Color Crazy. Locker hooked textured square in T-shirt Noodles Yarn in Winegum color with Orchid Rayon Ribbon center. Fun! Rayon Ribbon in Orchid from Color Crazy. 1/2″w. Fleurette oversized coaster in Mulberry Wine and Orchid fabric strips. Framed in Orchid rayon ribbon from Color Crazy. Fleur de Lys pad locker hooked with Color Crazy Poppana strips in Wheat and a fleur de lys design ruched and framed in Orchid cotton fabric strips. Framed in Orchid Rayon ribbon. The post Pantone’s Radiant Orchid for Locker Hooking? Love it… appeared first on Color Crazy. The post New Rug Canvas Arrives at Color Crazy appeared first on Color Crazy. The post Floral Designs for Hooking & Stitching appeared first on Color Crazy. The post Locker Hook a Spring Garden Bouquet appeared first on Color Crazy.